Pseudepigraphic work not contained in the Septuagint (and therefore not included in the Apocrypha). At present it exists only in Greek and in translations made from the Greek; but it is probable that it was written originally in Hebrew. 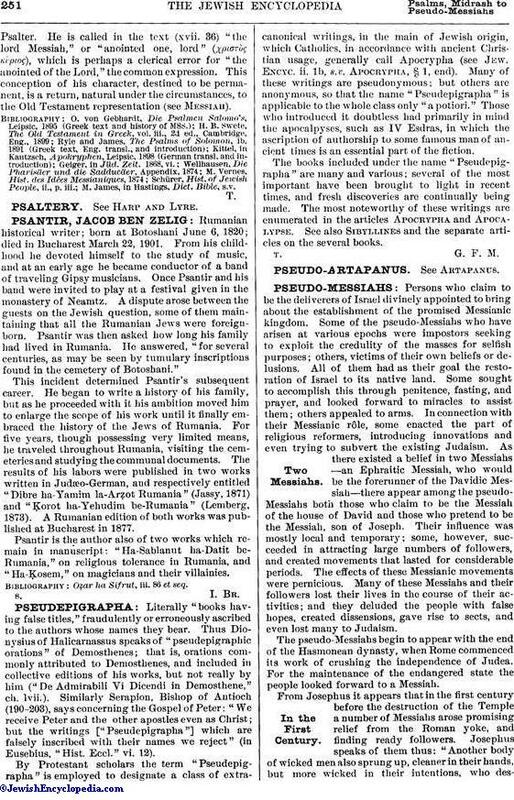 It is Palestinian, and Hebrew was the natural language for a Palestinian Jew; the rude and sometimes unintelligible character of the Greek and the fact that a number of its obscurities may be ascribed to a misunderstanding of Hebrew words make it probable that the Greek work is a translation of a Hebrew original. Thus, for example, the impossible τοῦ εὶπεῖν ("to say"; ) of ii. 29 may easily have arisen from a miswriting or misunderstanding of (for ; "to change"; comp. Hos. iv. 7); and the future tense in ii. 12 and elsewhere may be due to a false interpretation of the Hebrew imperfect. It is uncertain when and why the psalms were ascribed to Solomon; the simplest explanation is that as David was reckoned the author of most of the canonical psalms, this later production was ascribed to Solomon, who stood next to David in literary glory, and was the titular author of two psalms of the Psalter. The book consists of eighteen psalms, the contents of which may be summarized as follows: suffering inflicted by foreign invasion (i., viii. ); desecration of Jerusalem and the Temple, death in Egypt of the invader (ii. ); debauchery of Jewish "men-pleasers" (iv. ); recognition of God's justice in rewarding the pious and in punishing the wicked (iii., vi., ix., x., xiii., xiv., xv. ); expectation of and prayer for divine intervention (vii., xi., xii., xvi. ); description of the Messiah (xvii., xviii.). A definite mark of date is given by the mention (ii. 30, 31) of Pompey's death (48 B.C.). The political situation depicted (the delivery of the city to the invader, the slaughter of the Jews, and the pollution of the Temple) answers fairly well to the account of Pompey's conquest (63 B.C.) given by Josephus ("Ant." xiv. 3, § 4); and there is no need to suppose a reference to Antiochus Epiphanes or Herod. 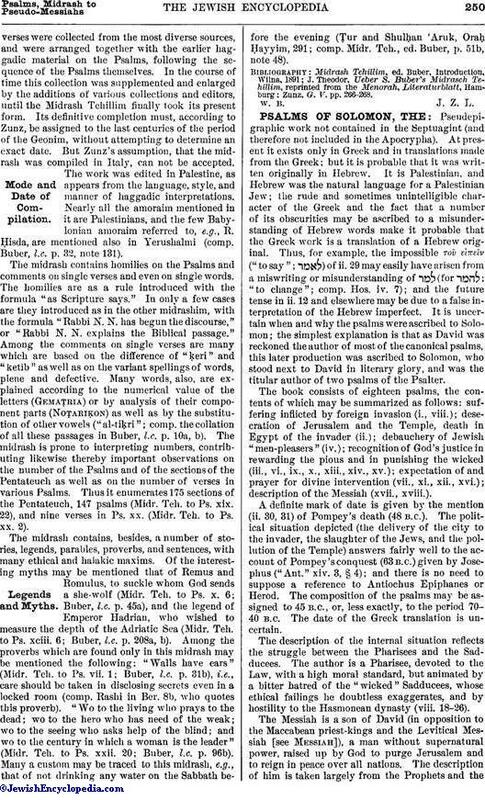 The composition of the psalms may be assigned to 45 B. C., or, less exactly, to the period 70-40 B. C. The date of the Greek translation is uncertain. The description of the internal situation reflects the struggle between the Pharisees and the Sadducces. The author is a Pharisee, devoted to the Law, with a high moral standard, but animated by a bitter hatred of the "wicked" Sadducees, whose ethical failings he doubtless exaggerates, and by hostility to the Hasmonean dynasty (viii. 18-26). The Messiah is a son of David (in opposition to the Miccabean priest-kings and the Levitical Messiah [see Messiah]). a man without supernatural power, raised up by God to purge Jerusalem and to reign in peace over all nations. The description of him is taken largely from the Prophets and thePsalter. He is called in the text (xvii. 36) "the lord Messiah," or "anointed one, lord" (χριστὺς κύριος), which is perhaps a clerical error for "the anointed of the Lord," the common expression. This conception of his character, destined to be permanent, is a return, natural under the circumstances, to the Old Testament representation (See Messiah). M. James, in Hastings, Dict. Bible, s.v.